A college education is an investment in your future. Like any other investment, it’s important to understand the financial aid process so you can make the best choice for your needs. At WSU, using financial aid to pay for college is easier than you think. In fact, 80% of WSU students receive financial aid. There are several types of financial aid including grants, scholarships and loans. You can also combine different types of aid to help pay for college. Learn more about the financial aid process and timeline. The Free Application for Federal Student Aid (FAFSA) is the main application you need to apply for financial aid at WSU. Complete the FAFSA each year, and consider applying for scholarships too. Need help figuring out the financial aid process? Have questions about your award letter or how aid money is distributed? Financial aid counselors are available to help you understand how you can fund your college education. 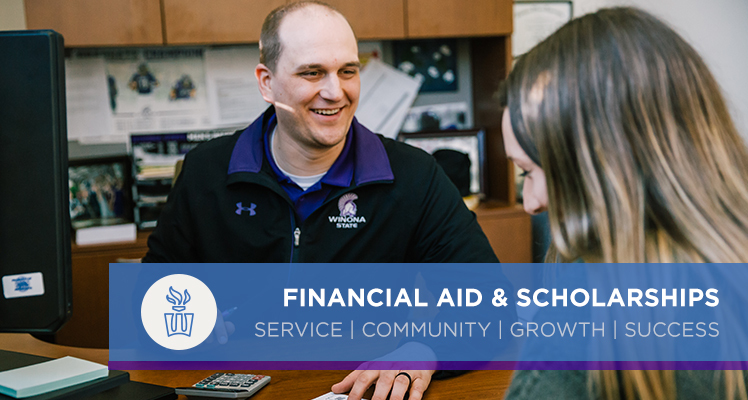 Contact the Financial Aid Office at financialaid@winona.edu or stop by the Warrior Hub to talk in person. Take control of your personal finances this semester. The Money Management website has resources to help strategize how to pay for college, plan for future careers and handle financial stress.